Although NMR is a capable technique, the low values associated with the nuclear spin polarization provide inherently weak signals. Enhancement of this signal allows faster acquisition times or greater signal to noise ratio, improving the sensitivity of the NMR experiment. The electron gyromagnetic ratio is approximately 660 times greater than that of the proton, suggesting a far higher electron polarization under the same conditions. This can be seen below in a plot of Boltzmann polarization vs. temperature at 9.4 T.
If the high polarization of electron spins at low temperature could be transferred to the nuclear spins of the sample under test, the weak signals associated with NMR would become enhanced. This polarization transfer can be driven by microwave irradiation, using a technique called dynamic nuclear polarization (DNP). However, liquid samples do not experience the DNP mechanisms present at high fields in dielectric solids, such as the solid effect (SE), and therefore prove much harder to receive enhanced signals from. This is mainly due to the fact that attempting to irradiate a liquid sample with microwaves will result in excessive sample heating, destroying any chance of receiving NMR signal. This is a notable problem, as many of the more interesting and biologically relevant samples that could benefit from the enhanced signals experienced with DNP are found to be in liquid-state under standard conditions. Performing experiments on these samples in the solid-state would not represent the usual sample behaviour, meaning that a liquid-state technique is required to obtain realistic and useful information about the sample. Polarizing the sample with microwaves at low temperature, ensuring a polarization boost, before rapidly bringing it to liquid-state at ambient temperature provides a solution by which enhanced liquid-state NMR can be obtained. This is what our group aims to do at the University of Nottingham, with the rapid heating stage completed using a number of different stratagies. Light may respond to matter in a number of ways. It may simply pass through with no interaction, or it may be absorbed or scattered. Absorption will occur if the energy of an incident photon matches the energy gap between the ground and excited states of a molecule. This will promote the molecule to an excited state, allowing the absorption spectrum to be measured as a loss of that specific energy from an original light source. Light may alternatively be scattered by the matter, a process which does not require the photon energy to match the energy gap between molecular energy levels. Local distortion of the molecular electromagnetic field caused by incident light can create unstable virtual energy states, from which photons will quickly be re-radiated. When performing Raman spectroscopy, information comes from changes in the energies of these re-radiated photons, as nuclear motion of the molecules under test subsequently acts upon them. If the scattering only arises from deformation of the electron cloud then the energy changes in the re-radiated photons will be tiny and the interaction can be described as an elastic scattering event. However, the scattering event is described as inelastic if the interaction causes nuclear motion and the energy difference if sufficient. The elastic scattering of light from molecules is called Rayleigh scattering, while inelastic scattering is called Raman scattering. 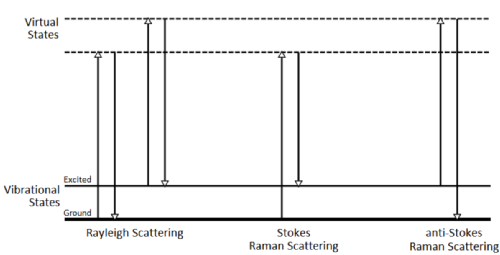 Depending on whether the scattered photon is lower or higher in energy than the incident photon dictates whether the light is Stokes or anti-Stokes scattered, respectively. Most molecules are in the ground vibrational state at room temperature, suggesting a greater occurrence of Stokes scattering than anti-Stokes at this temperature. The populations of molecular energy levels is described by Maxwell-Boltzmann statistics, a relationship dependant on temperature. 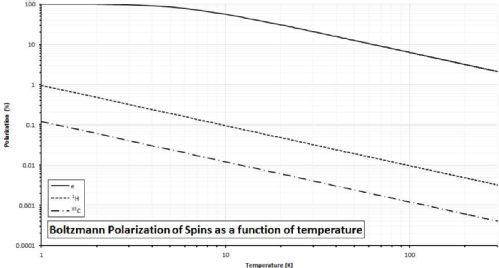 This temperature dependence is that which will allow insight into the sample temperature through measurement of Stokes and anti-Stokes intensities. An alternative possibility for measuring sample temperature using Raman spectroscopy relies on the fact that certain regions of the spectrum may experience different amounts of Raman shifting or alter in shape as a function of temperature. This is due to a change in bond properties. For example, the O-H group stretching signal may appear as a convoluted and broad superposition of various types of hydroxyl bond. This will be due to some groups being further bonded to different parts of the molecule, altering their vibrational and Raman scattering properties. The amplitude of the Gaussian components will be proportional to the concentration of contributing O-H bonds. 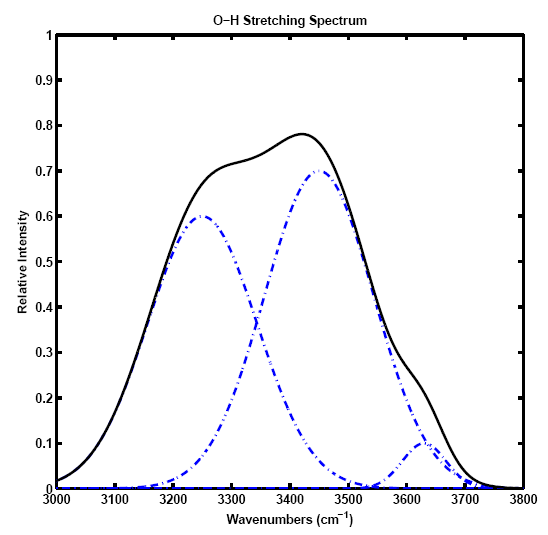 These concentrations depend on the temperature of the sample, thus causing the characteristic bands of the overall O-H stretching signal to respond as temperature changes. Measuring certain parameters of these bands, such as the ratio between peak intensities, provides a suitable method for calculating the temperature of the sample.